One of my personal favourites - worth clicking on to see full size. 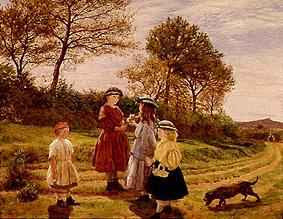 James Archer (1823-1904) painter, was born in Edinburgh on 10 June 1822, the eldest child of Andrew Archer, dentist, and Ann Cunningham, his wife. His sister was Georgina Archer (1827–1882). He was educated at the Royal High School, Edinburgh. Afterwards he entered the Trustees' Academy in Edinburgh, studying under William Allan and Thomas Duncan. In November 1840 he was accepted as a student at the life school of the Royal Scottish Academy and he attended classes there until 1852. His association with this school continued in the role of visitor between 1858 and 1862. He was, together with James Drummond and Joseph Noël Paton, a signatory to the Report on the Conduct of the Life Academy (1858), which proposed the future direction of the academy's life school. It stressed the absolute importance of drawing as opposed to colour and composition, which Robert Scott Lauder had propounded at the Trustees' Academy, and Archer's own painting reflects this emphasis with its carefully worked line and meticulous attention to detail. 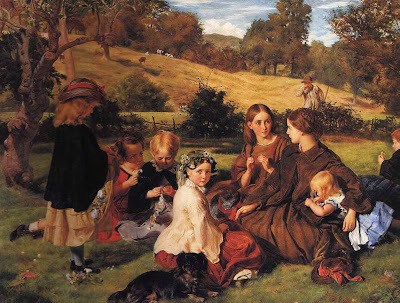 James Archer first exhibited at the Royal Scottish Academy in 1842, with the biblical The Child St John in the Wilderness. However, from the very beginning of his career he built up a successful practice in portraiture. He worked in oil, pencil, and chalk and among his sitters was Professor William Edmondstoune (1855; Scottish National Portrait Gallery, Edinburgh). Although he also painted a few Scottish landscapes during this period he turning increasingly to biblical and literary subjects as the years went by. As a sign of early success he was elected an associate of the Royal Scottish Academy in 1850 and an academician in 1858. His diploma work, Rosalind and Celia (1854; Royal Scottish Academy, Edinburgh), is characteristic of his work of this period. Taken from Shakespeare's play As You Like It, it enabled Archer to portray two elegantly dressed young women in sumptuous surroundings. 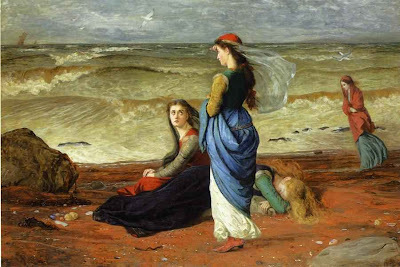 The drawing and detail are finely worked, reflecting the work of his contemporary William Fettes Douglas, and of John Everett Millais, whose painting Mariana (1851; Tate collection), had been exhibited in the Royal Scottish Academy in 1852, thus bringing Pre-Raphaelite painting to the notice of artists in Scotland. In 1859 a group of artists decided to establish their own artillery unit in response to the patriotic volunteer movement which spread across Britain from the fear of possible invasion from France. Thus the no. 1 company of the City of Edinburgh Volunteers (Artists' company) was formed. James Archer was appointed its second lieutenant and was involved in its organization and ceremonial functions. He resigned in May 1860 because he had plans to leave Edinburgh and, like many of his contemporaries, he chose to settle in London where he continued his portrait painting practice. During this period he painted three portraits of Professor John Stuart Blackie of Edinburgh University, Greek and Celtic scholar, the most important of which (1873; Royal Scottish Academy) depicts a full-length view of the windswept academic, wrapped in a plaid and before a fast-flowing stream in a wild, moorland setting. Reminiscent of Millais's portrait of Ruskin at Glenfinlas (1854; priv. coll.) it lacks the fineness of detail of Millais's painting but successfully places the sitter in context. During this period Archer became particularly interested in Arthurian legend. 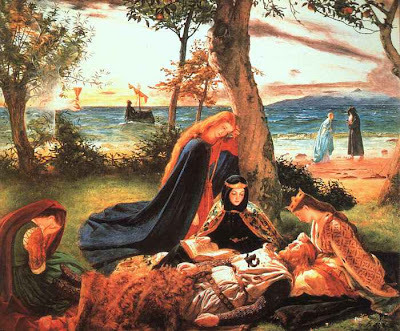 Starting with La Morte d'Arthur (1861; Tate collection), a romanticized costume drama in a landscape setting, Archer moved on to paint for example The Parting of Arthur and Guinevere and The Dying King Arthur (exh. Royal Scottish Academy 1865 and 1880 respectively). Other late subjects included Jacobite themes and stories of early Christianity, for example St Agnes, one of the Early Christian Martyrs (1886) which he wished to swap with Rosalind and Celia as his Royal Scottish Academy diploma work. This former work, as with most of Archer's paintings, was signed with his monogram, JA transfixed by an arrow. In the 1880s Archer travelled abroad in an attempt to bolster his career. He visited the United States in 1884 and there painted Andrew Carnegie's portrait. In 1886 he set sail for India in the hope of finding more patronage there. As well as portraits he painted the landscape and colourful costumes of India. He had returned to London by 1891. In the late 1840s in Edinburgh Archer had been a member of the Smashers Club. This was an informal association of artists who met to sketch together, to criticize each others' work, and to enjoy each others' hospitality. The other members at this date were John Ballantyne, William Crawford, William Fettes Douglas, John and Thomas Faed. It foundered when most of its members moved to England, but was re-formed again in London in 1863 as the Auld Lang Syne Club. Later, in the 1880s and 1890s, Archer served as secretary to another group called the London Scottish Artists. This body of expatriate Scots met each year at a dinner held to coincide with the Royal Scottish Academy's banquet at the opening of each year's annual exhibition. In 1891 Archer made a series of sketch portraits of the London Scottish Artists which he presented to the Royal Scottish Academy. These included William Orchardson, John Pettie, and John MacWhirter (Scottish National Portrait Gallery). James Archer married Jane Clerk, daughter of James Lawson, writer to the signet, on 1 August 1853, and they had one son and three daughters. He was a dapper, stylish dresser, bearded, and of slender build. When he moved to London, Archer first settled at 21 Lower Phillimore Gardens, later moving to 7 Cromwell Place, South Kensington. In the 1890s he moved to Milford, Surrey, and by 1903 settled in Haslemere. He died at Shean, his home at Haslemere, on 3 September 1904, and was buried in Haslemere. He was survived by his son and three daughters. with "James Archer" at the event. All this and much more available on www.t5m.com.